What does fixing Social Security mean? It can mean one of two things. First, assure the Trust’s solvency for the next 75 years (the period used by the Trustees). Second, assure the solvency AND the permanent sustainability of the program. In the next few months you will hear a lot of rhetoric about Social Security, unfortunately much of it misleading and designed to scare seniors. And, much of the rhetoric will be unaffordable promises about “expanding” Social Security; yet to be defined. Like Social Security or not, it’s here to stay and nobody seems to care that from a financial perspective for the individual it’s not a great deal; none of that matters. 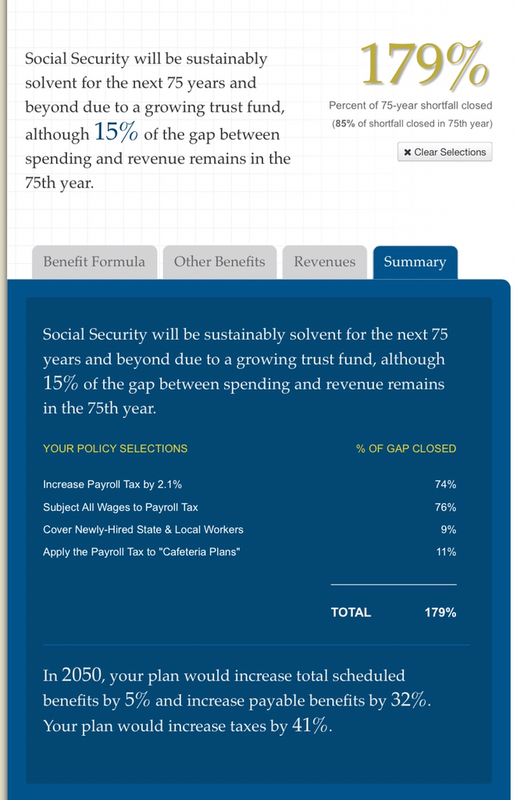 The CRFB provides a handy tool where you can select various options changing Social Security and its funding and see the impact on solvency and sustainability. Here are a couple of options I selected. Note I did not cut benefits in any way, but only raised revenue. Other possibilities include changes in future benefits. Give it a try yourself at the link below. The above changes meet the 75-year solvency test only, but it puts the full burden on current workers. The payroll tax increase is split between employer and worker (1.05% each). Currently contributions to a flexible spending account or health savings account are not subject to FICA payroll taxes and neither are health insurance premiums paid on a pre-tax basis (“Cafeteria Plans”). The above changes are more aggressive making the program sustainably solvent. Note that in this case taxing all wages means that the final monthly benefit is also based on all wages thereby maintaining the original intent of Social Security. Now that you see what it takes to keep SS going as it is, you might want to listen closely when you hear about expanding benefits. The Committee for a Responsible Federal Budget (CRFB) is a bipartisan organization, made up of some of the nations leading budget experts, committed to educating the public about issues that have significant fiscal impacts. So long as Congress takes the blame for increasing taxes and reducing paychecks, I can live with applying the same FICA tax rules to IRC 125 cafeteria plans as we have applied to IRC 401(k) plans since 1983. Yes, that is true. Back in 1983, employee pre-tax contributions to a IRC 401(k) plan were pre-tax for FICA purposes. However, the problem is that Congress will only use such revenues to buy votes. Similarly, when they removed the cap on FICA-MED, 20+ years ago, it was to be a great solution to underfunding Medicare Part A Hospital Insurance. Baloney. So long as Congress can use these taxes to buy votes, so long as they can assess the tax on one portion of the beneficiary population and not another, so long as people get benefits that far exceed the value of the taxes they caused to be contributed to the program, you will have this baloney continue. Finally, these are static solutions. You need a solution that adjusts pricetags every year so as to be intergenerationally savvy – solvency in current year, in 5 years, 10 years, 20 years, 25 years, 50 years, 75 years, 100 years and indefinitely. Otherwise, it will again end up like it did in 1983 – pushing the burden off into the future to be born by taxpayers yet unborn. I happen to have written on the 1983 reform, and the big ticket items fell on people who were 17 and younger at the time. The big ticket items were age adjustments, pushing tax rates forward, means testing, and including federal employees. SSA provides a summary of the 1983 changes, and this one isn’t listed. Changing the taxation of employee 401K contributions would be a huge inflow of cash. My guess is that the change was made in 1977, or that you are looking at pension costs. Either it was a small part of the 1983 package or SSA isn’t explaining the 1983 deal correctly. Richard, Surprised that you posted this. The CRFB does not include interactions of multiple proposals. The SSA says that raising the payroll tax 2.1% nearly two years ago would have solved 70 something percent. That assumes that you don’t add on a separate job-killer like taxes cafeteria plans. You can’t just add these numbers together and call it fixed. The problem is that everyone is a economic wonk with these tools. They plug in how someone else will pay taxes to pay for it, and then call it easy. Are you saying the results of these examples are wrong? According to details behind some of the assumptions they do consider interaction with other changes. I would like to hear more how not allowing pre-tax premiums under a 125 plan is a job killer. I managed benefits for nearly 50 years and the first 20 or so didn’t have this benefit and nobody noticed and certainly there was no affect on jobs before or after. In fact, I bet most employees don’t even know they have it when they do. Let me know what your understanding of applying FICA to tax-protected benefits. I made $100,000. The company paid about $50,000 in benefits (1/3rd of my total). That is across every benefit that my job offered, including matching donations to charity. My guess is that included about 5K to ‘pay’ for my vacation, which was actually paid for in overtime. I am not sure how you exclude any of these benefits from the tax. That’s not what the calculation is talking about. But that’s a whole other issue and a major revenue loss. 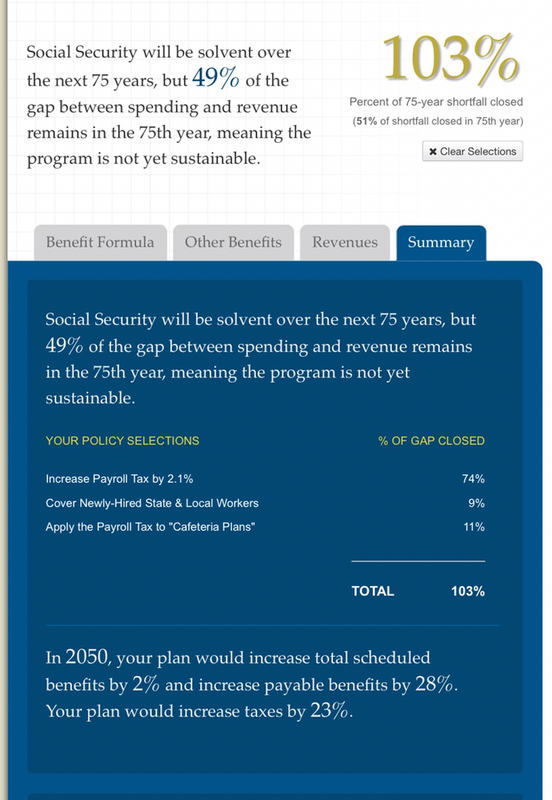 All the SS calculator is considering is Section 125 pre-tax plans, premiums, FSA, HSA. Health insurance by itself is a large cost. The Cadillac tax on Obamacare starts at 10,000 or nearly $30,000 per family. My healthcare runs 12-18K, and we don’t have caddy care. That is a pretty typical package with higher deductibles than most companies offer. Most of the $50K that I was told comes from healthcare, and that pre-dates Obamacare. That is a useful tool, thanks for posting it. Hopefully people can discuss based on facts rather than rhetoric. I would equally bet that employees do not fully appreciate the size of the benefit. This tax will make it very visible. When I made $100,000, the ballpark number that I heard was that benefits made up a 1/3rd of my employee cost. That would mean my hidden cost was about $50,000. That is pension, health, and the rest of the perks which I maxed out. If you hit that $50,000 with a 12.4% tax, it is a $6,000 tax. Yes the employees will notice. You would have to tell me which options allow for interaction. I think the mechanics sum the individual cost savings. I think you misunderstand this. It’s not taxing the value of the employer contribution, but the pre-tax employee contributions.